Michael Phelps has a Morton’s Toe, is that why he is great? 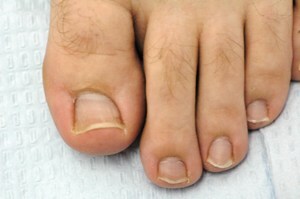 Home > NewsRelease > Michael Phelps has a Morton’s Toe, is that why he is great? According Dr. Burton S. Schuler of FootCare4U.Com, the world's greatest swimmer/Olympian Michael Phelps absolutely has a Morton's Toe.
" we know that having a Morton's Toe can make your arch drop or flatten out This could be of great benefit to Phelps in the water, in that it could make his foot a more contiguous unit to kick with, but I would not know for sure unless I could examine him. The one thing I do know for sure is that one of his sisters or his mom must also have a Morton's Toe"
In the 1920's and 1930's Dr. Dudley J. Morton of Yale Medical School and Columbia Medical School wrote that problems with the 1st metatarsal bone, known as a Morton's Toe could be the reason for most foot problems. Dr. Morton wrote three separate books about the problems with the 1st metatarsal bone, the most famous one being the Human Foot published in 1938 by Columbia University Press. Dr. Janet Travell, White House physician to Presidents Kennedy and Johnson, and Professor Emeritus of Medicine at George Washington University took this concept further by writing and teaching that the Morton's Toe could cause pain all over your body. She wrote and taught for four decades that a Morton's Toe could cause, back, hip, knee, leg, and foot and ankles problems. She also said that the Morton's Toe could be the reason for myofascial pain anywhere in your body. What is a Morton's Toe? A Morton's Toe, is either one of two problems that can affect the first metatarsal bone of the foot. 1. The first abnormal condition, and the most noted one, that can cause Morton's Toe is where your first metatarsal bone is shorter than your second metatarsal bone. 2. The second condition that can cause a Morton's Toe is when your first metatarsal bone is not as stable as it should be, and as a result, has too much motion. This is known as "Hypermobility of the First Metatarsal Bone." Get E-mail Alerts When La Luz Press Sends news releases.